Aria: I mean nobody tells you anything when you want to know it only when they feel like telling it. Hanna: And then they only tell you enough to make you crazy to know more. Permalink: And then they only tell you enough to make crazy to know more. Granted, they are responding to Melissa's promise that Spencer would get the truth soon, but it really applies to all the fans of the show. It's getting to where I can't stand the crumbs of satisfaction the series gives us in the forms of half-truths and small revelations. Pretty Little Liars Season 5 Episode 11 is actually a pretty slow wind-up for what's being advertised as a "deadly" finale. You would think with this much hype surrounding the end of Alison's first season back home that there'd be a little more excitement and a little less pointless digression (sorry, Caleb!). After Hanna cleaned up her act in Pretty Little Liars Season 5 Episode 10, she expected Caleb to do the same. Unfortunately, that hasn't been an easy thing for Caleb. 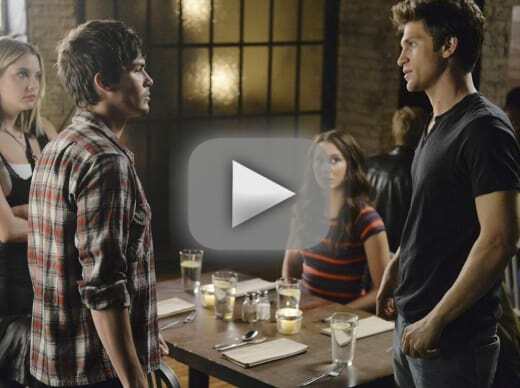 And the resolution of Caleb's troubled time in Rosewood is unbelievably silly. Sure, Ravenswood was billed as a supernatural show, but the Pretty Little Liars writers should have avoided trying to merge the crazy events of that draka with the (somewhat) reality based Rosewood. Plus, that plug for the Ouija movie was annoying! Aside from Caleb's recounting of his time in Ravenswood, the rest of the hour consisted of the girls hemming and hawing about what to do about A, what to do about Ali (whether those two are the same person) or what to do about Melissa. 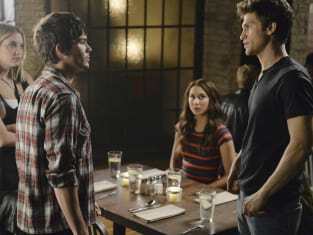 Aria has another clash with Mona that leaves her feeling more sympathetic to former A. Not exactly a high point in the evening either. As usual, Emily was the only doing any real work towards figuring out what Alison is up to. Her work with Ezra uncovered an incriminating photo, but, as she smartly points out, Alison is very good at turning the truth around in her favor. Spencer has some real family drama this week (yet again! ), as she receives that video confession Melissa recorded last week. Apparently, Melissa thought Spencer killed Alison. Not such a stretch since Spencer once thought she did it too. However, all evidence to the contrary, Melissa really cares for her boyfriend-stealing little sister and attempted to cover up Spencer's crime. Unfortunately, she ends up effectively killing Bethany Young by burying her alive. Melissa's confession puts Spencer in a tight spot. Her sister is guilty of tampering with crime scene and possibly even murder. But who put Bethany in clothes exactly like Alison's? Someone planned for Bethany to be stand-in for Alison. Could it have been Mrs. Di? Alison? It makes Alison's little trip to see Cyrus an even stronger indication that she's A. The girls need to figure something out soon since Lt. Tanner is quickly finding the connections between Bethany and the liars. And it looks like she might have convinced at least one of the girls to tell the truth. The obvious choice here is Alison, but could it be someone else? Or is this just a clever move on Tanner's part to force the girls to confess? And what about Spencer? She has some evidence in her hands that could really save her and her friends, but only at the cost of her sister's freedom. Should Spencer give Melissa's confession to Tanner? Yes, it's the only way to save the liars from jail. No, she can't betray her sister. I don't think it will matter now. 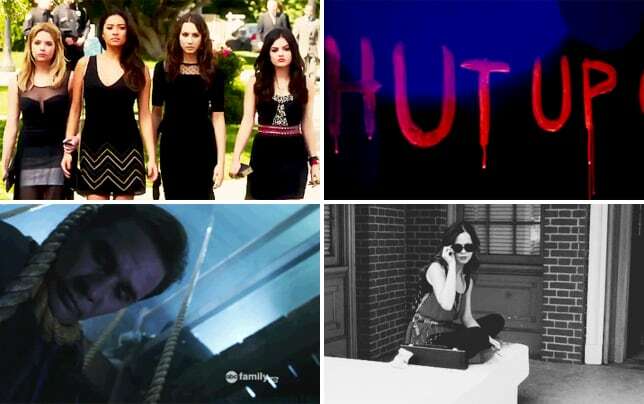 Here is your first look at Pretty Little Liars Season 5 Episode 12. Who will die?! ?